Podi uthappam is one of the favorite uthappam varieties for myself and Raksha. We love it more than Onion uttapam.I can have it for breakfast,dinner or just as an evening snack with hot coffee or tea. I pack this dosa for her lunch box at least once in a week.Whenever I prepare fresh Idli Podi(Gun powder in English),Raksha demands this Podi dosa. 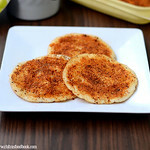 I make crispy podi roast dosa adding ghee if she wants to have at home and thick mini uthappam if carrying for school. In hotels,you could find the same with onions and served as onion podi dosa. For variations, check out my Tomato Onion uttappam and Kadai onion uthappam recipes. As I have not updated my old idli podi post, I have shared the recipe for spicy Idli powder using Garlic in the recipe section.It is my mom’s signature recipe which she has been doing for ages.You can also use Idli podi with sesame seeds/Ellu podi if you like.It tastes great with both .Try it and enjoy making Podi dosa or smear it over piping hot idli . 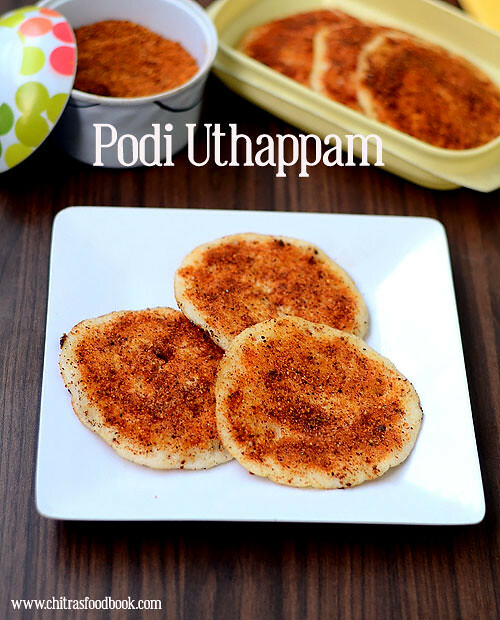 Lets check how to make Podi uthappam recipe adding Garlic Idli Podi recipe. 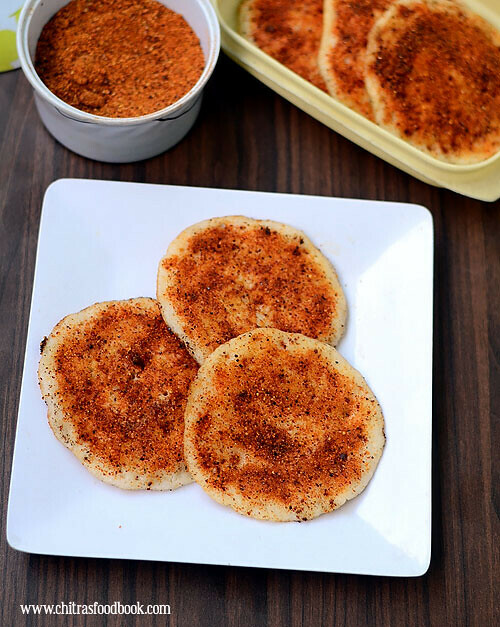 How to make Podi Uthappam recipe using Garlic flavored Idli Podi/Gun powder. Heat 2 tsp of oil in a kadai and roast the dals, red chillies, curry leaves separately OR roast everything together in low to medium flame by mixing constantly to avoid burning. My mom roast everything separately and grind them together.But I roast them together.Both procedure takes the same time.So do it as per your wish.After the dals cool down,grind them in a mixie jar coarsely.Lastly add the salt and roughly chopped garlic cloves.Grind it to a slightly coarse powder.Mix well and store in an air tight box to retain the aroma of garlic.This podi tastes spicy for first 2 days then it blends well & becomes perfect. For making Podi dosa,take the dosa batter and add 1/4 cup of water if the batter is too thick.Heat dosa pan and pour a ladleful of batter.Do not spread it.It will automatically spread by itself to some extent.Make it thick and spongy. Drizzle a tsp of oil and cook in medium flame for few seconds.You can also cover cook it.After the dosa is 3/4 th cooked on top,sprinkle idli podi all over the dosa.Add more or less depending on your taste.Drizzle one more tsp of oil over the podi and flip the dosa.Cook it for few seconds and remove it.Serve hot with your favorite chutney or enjoy as it is ! Enjoy ! For variations,you can sprinkle finely chopped onions ( tomatoes too) after the dosa is half cooked and then sprinkle idli podi.Cook till onion turns golden brown and remove.Use sesame seeds Idli podi/Ellu podi in place of Garlic Idli Podi. 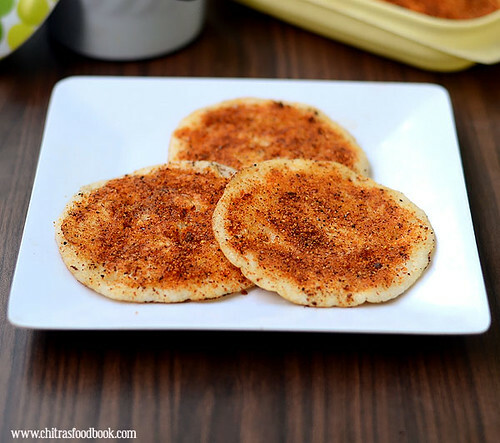 Soft,thick and spicy Podi uthappam is ready for breakfast/dinner or just as after school evening snack !! Enjoy !